Susan Entwistle is one of the few pointillist painters practising their art. Her unique style of painting is created with layers of colourful dots to capture the vibrancy and essence of beautiful gardens, woodlands and landscapes. Her work has sprung out of the nostalgia of a childhood that was so often centred on the garden and the natural landscape around her. After following a career in knitwear and textile design, designing embroidered textiles for companies such as John Lewis and Laura Ashley, Susan returned to her first love of painting in 2006. ‘As a self taught artist my design background has influenced and shaped the style I paint in. There are many similarities between creating a textile design that is aesthetically pleasing to the eye and creating a pleasing composition in a painting. The embroidered element of my textiles that were created in a ‘painterly’ fashion has easily evolved into the pointillist style I now use in my paintings. Colour is all important in my work. I create the painting by building layers of coloured dots and marks using acrylic paints instead of threads to emulate a tapestry-like impression of my subject. Susan works to commission for individual clients and organisations. 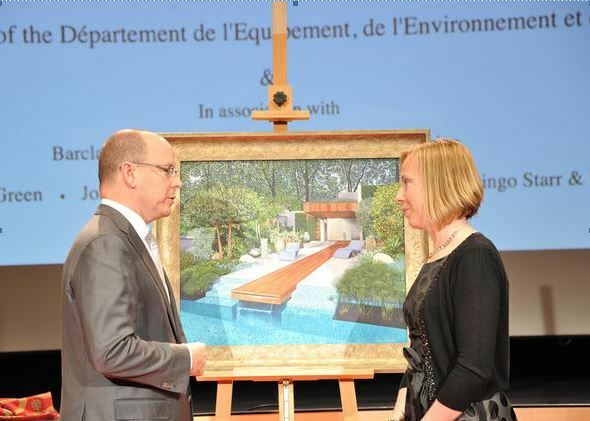 Her most distinguished commission to date was to paint the Monaco garden for HSH Prince Albert of Monaco which she presented to him personally at an event in Monaco at the Princesse Grace Theatre.